Food trucks — three years ago them were fightin' words in Charlotte. That's when the city's quest to minimize the presence of construction-site taco trucks ran headlong into a newly burgeoning culinary scene among a young, mostly affluent population. Eventually, city ordinances settled into a friendlier attitude, and South End's Food Truck Friday grew into the requisite hangout for a young crowd looking for a laid-back social scene. Perhaps predictably, once the new tradition got a foothold, Charlotte's ubiquitous development put an end to it. These days, Fridays find trucks scattered around the city. Sycamore Brewing has inherited the South End scene, while the original Food Truck Friday has moved to a biweekly affair in Plaza Midwood. 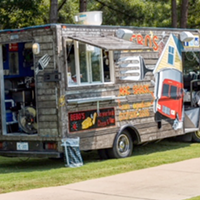 Several smaller gatherings have popped up around town, from Prosperity Church to Rock Hill, and today food trucks are standard fare at any outdoor event. So do we really need another food truck rally? For Michael Rosen the answer is a resounding "Yes!" As director of operations for Carolina Commercial Kitchen, home base to 25 of Charlotte's mobile eateries, Rosen is privy to the pressures on the owners of those businesses. "There was nothing defined last year," after the dissolution of the South End location, he says. "A lot of the trucks were very unhappy." Only Sycamore's rally, which maxes out at 10 or 12 vendors, occurs every week, and many other locations were uncomfortably situated on concrete or asphalt with limited parking and bathroom facilities. "They just didn't do any business." 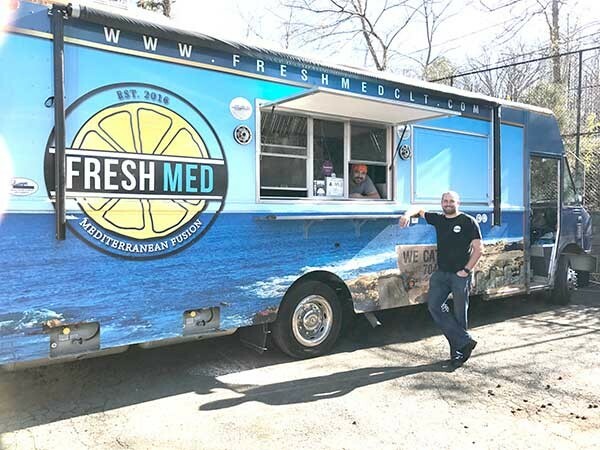 Fresh Med is a relatively new food truck that’s made a big splash. The owner, Tyler Lee, is standing; in the window is Chris Alves, the chef. The latest Cotswold Trucks Food Truck Rally on Providence Road offers a new Friday go-to with a different vibe, tilted more toward families with kids and dogs, Rosen says. Thanks to Trinity Presbyterian Church, customers won't be milling about a parking lot or stuck with an adult-focused drinking atmosphere. "There are tons of grassy areas with trees," Rosen says. "There are two gated kids' playgrounds that are right there. We have indoor bathrooms; we have tons of free parking." Live music will consist mostly of small duos and trios, keeping the ambience light. To start off, Rosen has 10 trucks confirmed each week through November, with the possibility of adding more as traffic demands. Some will appear every Friday, while others will rotate through. Fans will find familiar names like Papi Queso and Yummi Banh Mi, along with newcomers serving everything from barbeque and soul food to curries and hummus. "They all do extremely good food; they've all got that niche," Rosen says. It was Rosen, along with Casey Brawley, the owner of Carolina Commercial Kitchen, who approached Trinity Presbyterian with the idea of creating a Cotswold food truck event. "Their eyes lit up," Rosen says. The church had been hosting its own small rally twice a year, but Rosen's offer was "a win-win situation," says Grace Lindvall, the church's associate pastor. "[Our rally] was always such a success that we've been interested in being able to do it more, but just couldn't necessarily take on the work," Lindvall says. With Rosen's connections and experience (he was integral in launching a similar rally in Matthews), the church is ready to open its doors every week. "We have a wonderful space that we want to share with the neighborhood and create a sense of community," Lindvall says. Aside from the other amenities, the church offers a basketball court, a softball field, and a third playground. "It's a little hidden," she says, "But kids are really good at finding playgrounds!" Between the wide variety of food and options for outdoor entertainment, Rosen and Lindvall are confident that Cotswold will rally behind this latest food-truck incarnation. "We're so lucky to have this space," Lindvall says. "And we want to make sure that we're sharing it and being good neighbors." Says Rosen, "We want the parents to come and have a good time and enjoy themselves and tell people about it." Sounds like the beginning of a beautiful Friday night tradition.